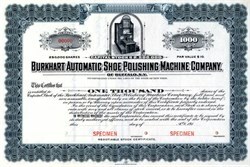 Beautiful certificate from the Burkhart Automatic Shoe Polishing Machine Company. 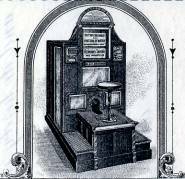 This historic document was printed around 1910 by the Franklin-Lee Bank Note Company and has an ornate border around it with a vignette of a coin operated automatic shoe polisher. Burkhart Automatic Shoe Polishing Machine Company, Buffalo, N. Y.; manufacture automatic shoe polishing machines; Capital $2,500,000. Charles F. Burkhart, Albert B. Wright, Albert J. Wright, all Buffalo.